To view this section on video, click here and start play at 2:16:05 PM. Mr. Wotherspoon: — Mr. Speaker, this is a government that’s failing to provide the mental health and addiction support that so many need all across our province, making it harder to understand how this government can justify the limited access to needed supports, given the massive tax increases this government has stuck working families with. Their unfair billion-dollar PST [provincial sales tax] hike has raised the price of nearly everything for hard-working families across Saskatchewan, all while cutting taxes for the very wealthiest. And by expanding the PST to construction labour, kids’ clothes, and restaurant meals, they’re leaving hard-working families struggling to make ends meet, with less and less left over at the end of the month and many not able to make ends meet. So my question to the Finance minister is this. How can she justify this unfair PST tax hike for families when our government is failing so badly at providing needed supports? Hon. Ms. Harpauer: — Mr. Speaker, it’s rather interesting because if you really listen to his question, he answered his question right within itself. Resource revenue fell by $1.2 billion, Mr. Speaker. We have three main sources of revenue in order to sustain the programs for this province, the programs that our citizens expect, programs that we’ve been asked questions about from the members opposite. Those are through taxes, through resource revenues, and through federal transfers. That’s our three main sources of revenue, Mr. Speaker. Resource revenues have fallen by $1.2 billion, which is why we had to make the very difficult decision to raise taxes. Those taxes are what pay for the health care, for the expenses for the areas of priorities that the members opposite keep asking for more spending. There is no magic wand, Mr. Speaker. There is no pot of gold at the end of the rainbow. We had to make those difficult decisions. If they want to be the government-in-waiting, where are they going to find the money? 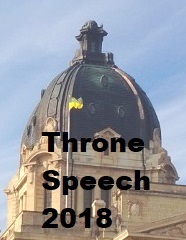 Mr. Wotherspoon: — Mr. Speaker, no one’s buying it in Saskatchewan. Saskatchewan people know that the PST hike is a direct response or a direct result of the mismanagement of this government, who didn’t save a dime during the best days. Mismanaged project after mismanaged project. The government’s damaging decision to unfairly raise and expand the PST isn’t just hurting families, it’s hurting our economy too. It’s killing jobs. Just look at the decision to add PST on to restaurant meals. In Saskatchewan, growth in restaurant sales has flatlined — less than 3 per cent since the Sask Party introduced this tax. That’s far behind the national average with growth of 9 per cent, three times more than here in Saskatchewan. Will the Finance minister admit that adding the PST to restaurant meals is hurting our restaurant sector and costing our economy much more? Hon. Ms. Harpauer: — Thank you, Mr. Speaker. I have met with restaurant owners and there was two factors that come into play, quite frankly. One of them was the changes in drinking and driving, and that also impacted. And I think all members of this House support those changes, as does society. So it isn’t just PST on restaurant meals that made a difference. However I’m happy to say that the latest statistics from Stats Canada show an increase now in restaurant meals. And so it is recovering somewhat, but it is also dependent on the economy. And we know that, again, there is a downturn in the resource revenues that is affecting the province. Mr. Wotherspoon: — Mr. Speaker, this is a government that saw a slowing economy and chose to put on the brakes. And we see that as well with their choice to push the PST onto construction labour. Building permits are down. Construction jobs are down. Tradespeople are feeling the pinch, and so many without employment. The impact of the PST on construction labour is felt by local businesses, by home builders, by contractors, and by municipalities that are looking to invest in infrastructure. It’s the epitome of a job-killing tax at a time where our province needs nothing more than jobs. Why can’t the Finance minister admit that it was a mistake to push the PST onto construction labour, and will she finally do the right thing and reverse that damaging decision? Hon. Ms. Harpauer: — This is an area, quite frankly, that this government will take absolutely no advice from the members opposite. There has been no government that has put more investment into infrastructure and construction than this government and these members on this side of the House. We have built 40 schools, Mr. Speaker, while they were closing schools on the average of one a month. We have built hospitals on this side of the floor where those members closed hospitals. They criticize any construction project that we have, Mr. Speaker, and yet they sit there and they’re going to say, well there needs to be construction. They closed everything in sight when they were in government. So we’ll be taking no advice from them whatsoever, Mr. Speaker.